Have you heard of the latest, coolest shopping app? Do you want cash back on your groceries and household products? Then this is the perfect app for you. Head on over and check out the Ibotta app for your smartphone. Pronounced “I-BOUGHT-A”. Get it Haha? 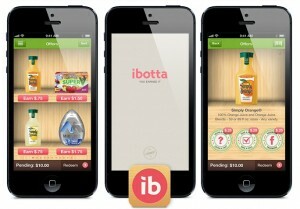 Prior to going shopping, pull up your Ibotta app, select the offers that you want to cash in on. These are more than likely items you were going to purchase anyway. Each offer has a different set of quick tasks to complete. Tasks include learning a fact about a certain product, taking a poll, sharing on Facebook, playing trivia, or watching a short video. Values for each task begin at $.25 and go up from there! Once you reach $5 or more you can cash out directly into your Paypal account – how awesome is that? Open this blog post on your smart phone. Go shopping at any of the qualifying stores near you. Want to save even more money? Stack your Ibotta savings with Manufacturer’s Coupons. You might even be able to get some for little to no cost. Check out some of the recent offers I’ve cashed in on. The iBotta app is available for iPhone and Android.